In the re-arranged Thursday night EPL fixture at Turf Moor (19.04.2018, kick off 19.45 GMT), Burnley look to do the double over Antonio Conte’s Chelsea and at the same time overtake Arsenal in the race for European football. Yes, you might need to do a double take on the opening paragraph. Burnley beat Chelsea at Stamford Bridge on the opening day of the season, after going in at the interval 3-0 up and a home victory will mean a quite remarkable Clarets double over the Blues. A second half revival in early August by the Blues failed to turn the half time deficit around and Burnley ran out 3-2 winners, despite Chelsea finishing the game with only nine men. The Clarets go into Thursday night’s encounter on the back of five successive wins and are hardly going into the clash as underdogs. 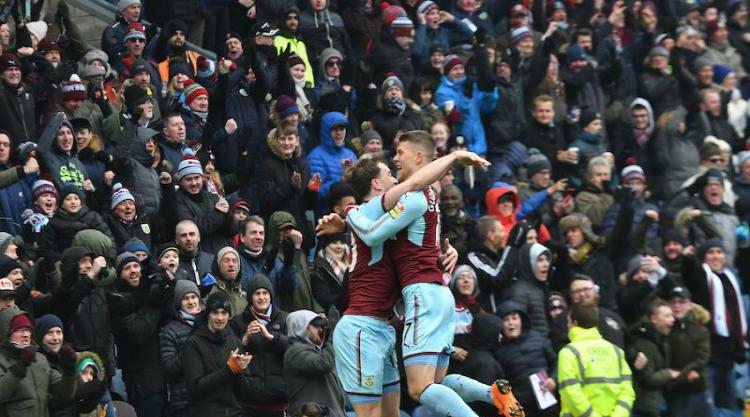 What is equally surprising is that three points for Burnley will take them above North London’s perennial European adventurers Arsenal and put Sean Dyche’s Clarets into sixth place in the English Premier League. To catch Arsenal, Burnley and Chelsea in the same breath has not been heard of since Burnley’s halcyon days, way back in the early 1960’s and during the Clarets short lived renaissance in the 1970's Adamson era. Burnley have suffered long term injuries which rule out Robbie Brady and Steven Defour. Tom Heaton is now fully recovered from a severe shoulder injury but is not expected to be recalled in goal at the expense of the excellent England World Cup hopeful Nick Pope. Ben Mee also looks certain to miss the game, but Burnley gaffer Sean Dyche goes into the encounter with no new injury concerns and I fully expect the Burnley starting line-up to be: (4-4-2) Pope, Lowton, Tarkowski, Long, Ward, Lennon, Cork, Westwood, Gudmundsson, Barnes and Wood. This line-up represents a settled Clarets starting eleven, who will inevitably look to continue to hunt down Arsene Wenger’s Gunners for a sixth-place finish and guarantee European football at Turf Moor for the first time in fifty years. Unless Southampton can pull off a major surprise and win the FA Cup, current projections suggest even an EPL seventh place finish will guarantee entry into the Europa League in July. Burnley’s victory against Leicester City on Saturday looks to have extinguished the Foxes’ European aspirations and it now looks to be a two-horse race for sixth place between Arsenal and Burnley. Pardon me for suggesting it, but given the bitter rivalry between two of London’s finest, might the circumstances just allow Chelsea to sit back, relax and let Burnley do their thing? One thing is for certain: Burnley will be going all out to record a famous straight successive sixth win and Chelsea will need to be at their very best to counter the set pieces and direct style that Sean Dyche’s team wilfully impose on the opposition (TEC).